Our Fragrance Oils are specifically formulated to be suitable in soaps, candles, and skin care products. The scents are extremely rich, complex, and long lasting. The fragrances are also extremely concentrated and it is difficult to get the true scent by smelling it directly from the bottle. We suggest that you dab a small amount on a tissue or cotton swab, then let it sit for a while to dry. Doing so lets the fragrance disperse and you can get a truer sense of the scent. All our fragrance oils are phthalate-free and paraben-free. The base oil used is a mix of olive, sesame and jojoba oils with a little vitamin E added to preserve the oil. They are produced with the latest technical equipment including mass spectroscopy, gas chromatography, simulated critical fluid extraction, and rotary vapor extraction methods. 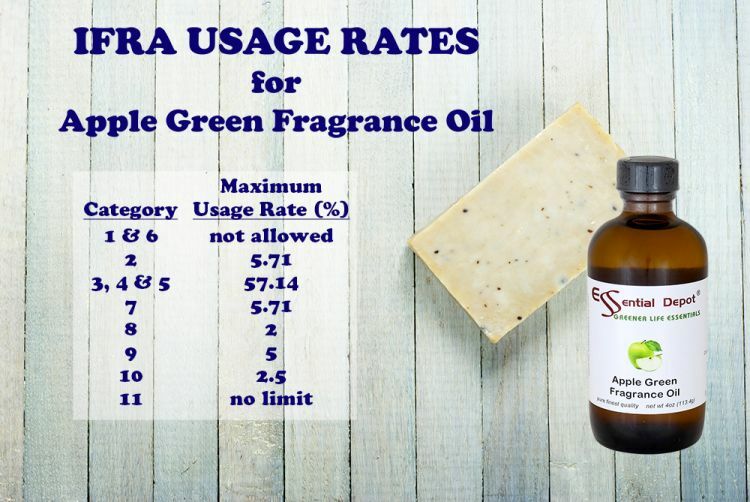 Our fragrance oils are sold by fluid ounce. In our amber glass bottles, you should expect to see the liquid level at a point midway between the “shoulder” and the “neck” of the bottle. Note: We can ship all our Essential and Fragrance Oils to Canada by UPS Standard. Products intended for eyes (eye shadow, liner, mascara, makeup etc) eye cream. 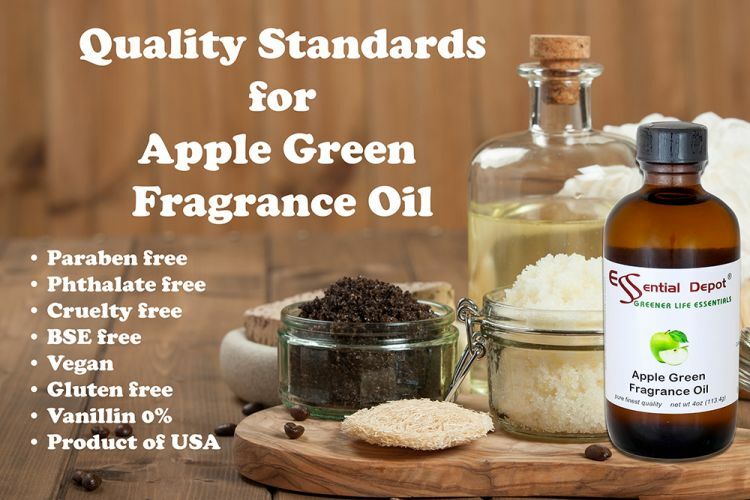 This shows us that you should not use Apple Green Fragrance Oil in categories 1 and 6. So this is not a good choice for lip balms, lipsticks, toothpaste or mouthwash. For category 2 (deodorants and antiperspirants) your formula may contain up to 5.71% Apple Green Fragrance Oil. (When you see, for example, category 3 listed as 57.14%, you may use 57.14% in category 3a, b, c & d.) There are no limits set on the amount you may use in category 11. Next, let’s look at the Quality Standards image. This card answers some of the main questions that customers ask about the oil. 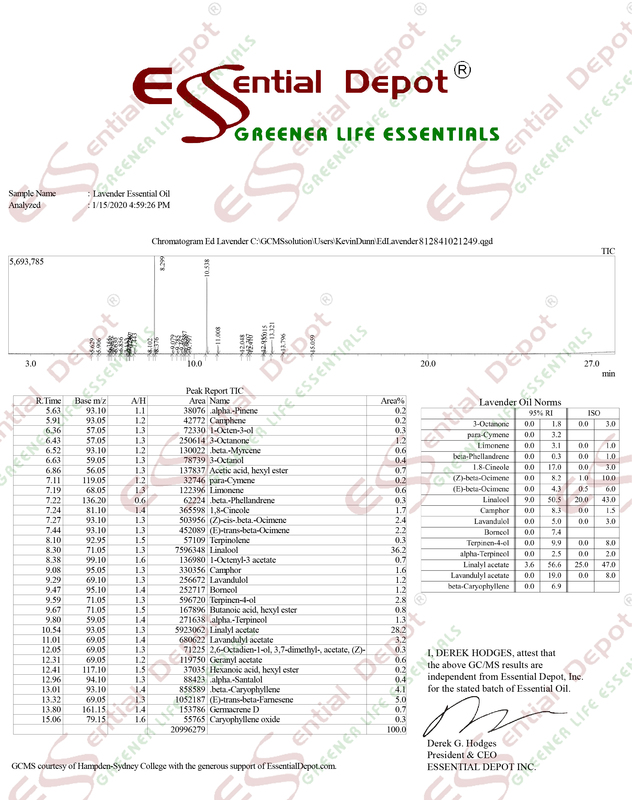 This is where you will find information as the vanillin content, the source of the product, whether it is tested on animals (none of Essential Depot’s products are animal tested), etc. These informational images are posted on most of our Fragrance Oils and contain information that has been provided by our supplier. If you have questions that are not answered by the IFRA Usage Rates or Quality Standards cards, please inquire; we’ll be happy to try to find that information for you. When soaping, we always recommend you make a small test batch first when trying a new fragrance oil. A fragrance oil may react unexpectedly in your recipe, causing a variety of issues such as seizing, ricing, discoloration, etc. For help with common soap making problems, please see our Soap Making Troubleshooting Guide. Lemon Blossom Fragrance Oil - 4 oz. Magnolia Fragrance Oil - 4 oz. Maple Sugar Fragrance Oil - 4 oz. Melon Berry Fragrance Oil - 4 oz. Neroli Fragrance Oil - 4 oz. Papaya Passion Fragrance Oil - 4 oz. Passion Fruit Fragrance Oil - 4 oz. Peach Blossom Fragrance Oil - 4 oz. Pear Fantasy Fragrance Oil - 4 oz. Pineapple Fragrance Oil - 4 oz. Pomegranate Fragrance Oil - 4 oz. Pumpkin Delight Fragrance Oil - 4 oz. Spiced Switchel Fragrance Oil - 4 oz. Sun & Sand Fragrance Oil - 4 oz. Sweet Pea Fragrance Oil - 4 oz. White Tea & Ginger Fragrance Oil - 4 oz.